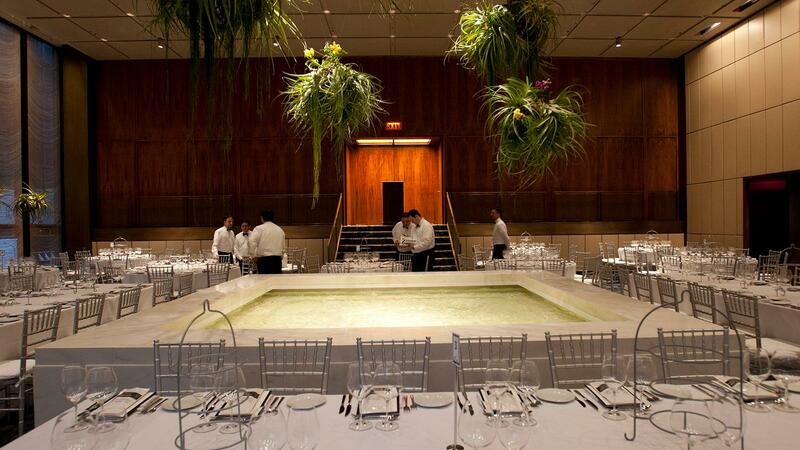 The annual Night to Remember charity cigar dinner was held at The Pool restaurant, the site of the former Four Seasons restaurant in New York City. Much of the premium cigar industry was in New York City the week before last. They came in for our annual Night to Remember charity cigar dinner, a black-tie event where we raise money for prostate cancer research. I will say that, in my experience, a more urbane cigar party does not exist. The night before the big event, Nestor Andrés Plasencia and I met at Lupulo for a few bites of high-minded Portuguese food. Rafael Nodal of Boutique Blends was supposed to join us, but was called away on some "very important FDA business." It's true, he did have business to attend to, and it was FDA related. What he didn't say is that his meeting was held at Danny Meyer's fancy restaurant The Modern. No matter. It gave Plasencia and I some time to talk about his Plasencia Alma Fuerte line (93 points, Cigar Insider), and his plans for the next release in the Plasencia line. And while all the cigar guys in town eventually converged at the Grand Havana Room, Nestor and I ended up at Carnegie Club, where I was fortunate enough to have an Alma Fuerte "custom roll." Right now, Alma Fuerte comes in three sizes, but he made me a special packet of coronas and they're fantastic. Powerful, but really tasty. Not sure they'll ever see commercial release. Nestor is staying true to his word and building his Alma Fuerte brand slowly. The next evening, Night to Remember was held at the Four Seasons...err, I mean the Landmark...uhh, no, I mean The Grill and The Pool. Or is it the Pool and The Grill? I'm not exactly sure. It still looks like the Four Seasons and still has most of the original architectural elements because it's a landmarked interior. All the walnut panels are still there, the shimmering chain-mail curtains still ripple on the windows and the general "power-lunch" feel has been preserved. The pool still bubbles in the middle of the restaurant like some strange Jacuzzi, a reminder of America's post-war prosperity when restaurants could afford to put Jacuzzis in the middle of their dining rooms for no apparent reason other than because a big-name architect like Philip Johnson told them to. It lends a sense of tranquility I suppose. Back when The Four Seasons opened in the late 1950s, the restaurant was known for using fresh herbs and "rare" mushrooms like chanterelles—common now, but pretty much unheard of at the time. We were a young country. Younger still, gastronomically speaking. But the new guys seem genuinely interested in keeping the place a dining destination and making sure it doesn't succumb to the yellowed clichés of "continental cuisine." Still, we can't smoke in the Seagram building anymore. After 20-some odd years, the building owner, not the restaurant owners, had a change of heart. (Something having to do with a new carpet.) So we smoked in a tent on Park Avenue before and after the dinner. I lit up a Montecristo Pepe Mendez Pilotico. It contains an heirloom strain of tobacco called Pilotico, grown by the Jose Mendez & Co., and it is very sweet tobacco. It kept me interested all night. Most of the cigar industry had vacated New York by the next morning, but Davidoff CEO Hans-Kristian Hoejsgaard stuck around to give a small talk on the new Davidoff Chefs Edition. He held court in the sleek lounge of Davidoff's lower Manhattan shop located just across the street from One World Trade Center. The blend was formulated by a bunch of European chefs who intended the cigar to smoke like a multicourse meal. It was a good smoke, and much more full bodied than Davidoff's typical limited editions. Sitting in the Davidoff lounge got me thinking about how Manhattan's high-end retail cigar landscape has become so corporate. The city has three Davidoff flagship shops, which are owned by Oettinger Davidoff AG. The two Cigar Inns were sold to Tabacalera USA/Altadis and turned into Casas de Montecristo. The Nat Sherman Townhouse now belongs to Altria. That's six major cigar shops owned by three multi-billion-dollar corporations. As for the independents, two out of the three Barclay-Rex shops have closed. Remember OK Cigars on West Broadway? Gone. Notice I said high-end. There are still lots of smoke shops and vape shops in the city selling cigars, cigarettes, magazines and candy, but that's not what I'm talking about. And I'm not complaining about corporations either. Don't take this as some anti-corporate rant. It just makes me wonder if an indy shop owner can be competitive anymore in the high-end echelon here in the Big Apple. Barclay-Rex still has one shop open in lower Manhattan on Pearl Street, and it's beautiful, but who else is left? Is that Manhattan's last independently owned, swanky cigar shop? Getting back to Night to Remember, Carlos "Carlito" Fuente Jr. was in attendance. Looking back, I'm surprised he was there. This was the day after he found out that a shipping container full of hundreds of thousands of cigars went missing. Considering the enormity of the loss, I'm impressed he was so calm. I wouldn't have been. I freak out when the laundromat loses one of my socks. One of the first things that happens when a huge cigar shipment gets stolen is that the thieves try to move the cigars quickly. So keep this in mind: If you're strolling the streets of New York, Miami or any other city, and find that your local 7-Eleven is suddenly selling OpusX cigars for $1.50 each, call the police right away—after you buy them all, of course.